We were saddened last week to hear that at least 30 people were killed and many dozens more injured in ISIS-related suicide bombings that targeted an airport and train station in Brussels. The Belgian and European Union capital joins Paris, San Bernardino, Ankara, Jakarta and too many other cities in the past year alone that have come under fire from the Islamic terrorist group. I was in Brussels most recently three years ago for an International Crisis Group meeting, and I was stunned by its beauty and elegance, highlighted with gold-trimmed architecture and vibrant flowers. In August, the city will celebrate the 20th anniversary of its Flower Carpet, which makes jaw-dropping use of over 600,000 begonias. This artistry stands in stark contrast to the cowardice and brutality we saw last week. While we can’t leave aside the immeasurable loss of life, tragic events such as these tend to have an enormous ripple effect on the economy. Between 70 and 80 percent of the European economy is based on consumption, and when people’s sense of safety and security ends up being rattled, they might temporarily avoid spending on travel and at malls, cinemas, restaurants and elsewhere. I definitely saw this to be the case in the days following the 9/11 attacks. As I’ve shared with you before, I was in Manhattan at the time, attending a financial industry conference. Except for emergency services, all of New York City shut down in every way imaginable, from subways to airports to cell phones. (Because I had a San Antonio area code, I could still make calls on my phone.) I was lucky enough to reserve one of the last available rental cars in the area, and on the long drive home to Texas, I passed many stores and businesses that had closed for the week. Indeed, few things are as disruptive to our lives and the economy as terrorist activity. 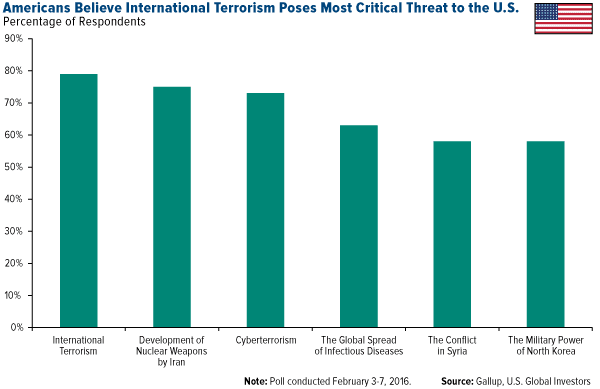 A recent Gallup poll found that 79 percent of respondents believe global terrorism to be a “critical threat” to the U.S., the highest of any other potential threat. 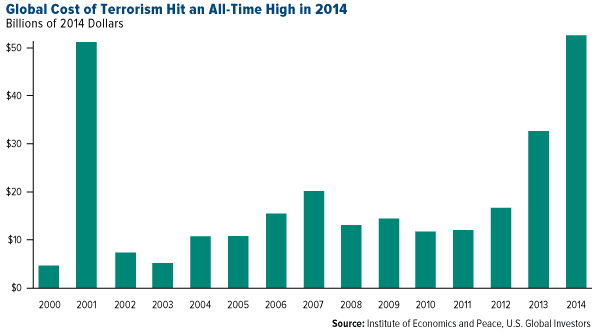 What’s more, the economic impact of global terrorism has been rising steadily since 2010. In November, the Institute of Economics and Peace (IEP) calculated its cost at over $52 billion in 2014, the highest ever. But this figure takes into account only direct, short-term costs. The 9/11 attacks were initially estimated to have cost $27.2 billion, but when you factor in indirect and long-term expenditures—the economic impact, war funding, future veterans’ care and more—it comes closer to $3.3 trillion, according to the New York Times. So who are the beneficiaries in the aftermath of such disruptive events? Following the Paris attacks in November, aerospace and defense stocks such as Lockheed Martin, Boeing and Northrop Grumman got a boost. Very often, governments use terrorist attacks to usurp individual rights and chip away at democracy. Little more than a month after 9/11, Congress passed the USA PATRIOT Act, which was vehemently criticized for violating people’s privacy. Similarly, one of the biggest consequences of the Brussels attack might very well end up being political. Fueled by the Syrian migrant crisis, far-right parties and nationalist movements have already been gaining ground in Europe—the Alternative for Germany party, the National Front in France, the Danish People’s Party—and Brussels will likely serve as an impetus for further change. The attacks also highlight the importance of owning gold, which investors have traditionally valued for its stability in times of crisis and currency fluctuations. Lately we’ve seen central banks all over the globe respond to lackluster growth with subzero rate polices, and this could accelerate if terrorist activity continues to shock our economies. The yellow metal is currently up more than 15 percent since the beginning of 2016, making it one of the best performing assets of the year. 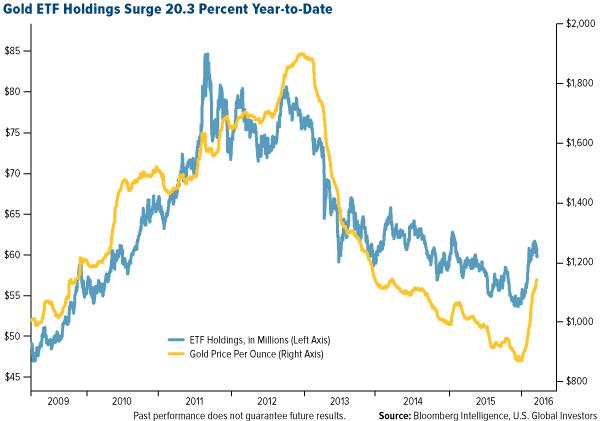 Over the same time, inflows into gold ETFs have surged 20.3 percent. Earlier this month I shared with you an observation from Pierre Lassonde, cofounder of Franco-Nevada, who told me that for every $1 billion that goes into the SPDR Gold Trust (GLD), the price of gold rises approximately $30 per ounce. I recommend a 10 percent weighting in gold—5 percent in gold stocks, the other 5 percent in physical bars, coins and jewelry—in both good times and bad. Speaking ahead of the Brussels attack, former British Prime Minister Tony Blair warned that “flabby liberalism” has helped cultivate an environment in which radical Islam can grow and, worse, be tolerated. A more assertive policy of “muscular centrism” is needed, he argued. Even though Mr. Blair—whom I’ve had the pleasure of meeting several times—was speaking of European politics in general, British in particular, I believe his advice should be heeded by all Western governments. Somehow we’ve gotten it in our heads that we should feel guilty for our beliefs and way of life. In Blair’s words, “we shouldn’t let people intimidate us into thinking there are certain values we shouldn’t be standing up for”—values such as freedom, personal liberty, capitalism and entrepreneurship. It’s these very values that have attracted some of the world’s greatest minds to the U.S. Consider the life story of Andrew Grove, the Hungarian-born Jew who went on to become CEO of chipmaker Intel and the man who’s widely credited for building Silicon Valley into the tech mecca it is today. Grove, who passed away last week at the age of 79, grew up behind the Iron Curtain in a country that, at the time, knew nothing of individual rights or personal and intellectual property. Had he stayed, it’s highly unlikely the world would have seen or benefited from the startling advancements in personal computing that came as a direct result of his involvement in memory chips and microprocessors. Fortunately for us, he managed to flee to the U.S., where he found the opportunity to pursue, develop and be rewarded for his talents. Grove, born András Gróf, was named Time’s Man of the Year in 1997. His 1999 book “Only the Paranoid Survive” is a seminal work on how computer technology has fundamentally changed business and led to new strategic inflection points. A similar story can be told of Ern? Rubik, inventor of the Rubik’s Cube, who was also born a Jew in Soviet-era Hungary. An architect by trade, Rubik originally conceived of his now-famous toy in 1974 but couldn’t get a patent on it until 1977. His options were very limited for manufacturing and marketing, and even once he was able to get his creation on store shelves, he received little credit or reward because communist and socialist countries don’t respect property of any kind, including intellectual property. The 3D puzzle game attracted hardly any attention until it was discovered in 1979 by a Hungarian expatriate who owned a games and toys company in England. A deal was negotiated with an American toy company, and Rubik’s invention, renamed the Rubik’s Cube, went on to become one of the most sought-after toys of the 1980s. Today, an estimated 350 million units have been sold worldwide. Like Grove, Rubik owes much of his success to the values of freedom, capitalism and intellectual property. We should acknowledge and celebrate them, not apologize for them. Whether from terror or disease or hurricanes, volatility is a fact of life. What’s important is to have balance, from the food we eat to the activities we engage in to what we put in our portfolios. As such, we need calm investing, which can offset this volatility with quiet, modest growth.